The worst storm in history seem from the wheelhouse of a doomed fishing trawler; a mesmerisingly vivid account of a natural hell from a perspective that offers no escape. The `perfect storm' is a once-in-a-hundred-years combination: a high pressure system from the Great Lakes, running into storm winds over an Atlantic island - Sable Island - and colliding with a weather system from the Caribbean: Hurricane Grace. This is the story of that storm, told through the accounts of individual fishing boats caught up in the maelstrom, their families waiting anxiously for news of their return, the rescue services scrambled to save them. It is the story of the old battle between the fisherman and the sea, between man and Nature, but here Nature is an awesome and capricious power that transforms the surface of the Atlantic into an impossible tumult of water walls and gaping voids, with the capacity to break an oil tanker in two, let alone the 72ft swordfishing boat Andrea Gail with her crew of eight. A typical Hurricane encompasses a million cubic miles of atmosphere and can contain enough energy to, in theory, meet the electric power needs of the UK for a decade. Except that a hurricane will not be controlled. 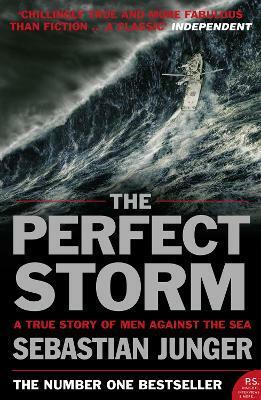 In spare, lyrical prose `The Perfect Storm' describes what happened when the Andrea Gail looked into the wrathful face of the perfect storm. Sebastian Junger grew up in New England and has worked as a tree-feller, Bosnian correspondent, journalist and adventurer. His first book, `The Perfect Storm', spent over four years on the bestseller lists and its film adaptation was a huge box-office success. Junger has been contributing editor to Vanity Fair, and winner of the National Magazine Award for Reporting. He has also written for magazines including Harper's, the New York Times Magazine, and National Geographic Adventure.